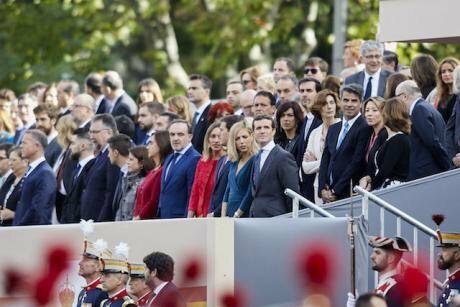 Pablo Casado (front right) attends Spanish National Day military parade in Madrid, October 12,2018. A.Perez Meca/Press Association. All rights reserved. Surprisingly, there are actually very few factual challenges to us here (though he does assert that we have distorted Franco’s connection to the Spanish flag and the “day of the race”, and that we do not recognise recent promises to establish a truth commission regarding Franco’s crimes). On this we can certainly agree. It is by no means the only purpose of our original article, but certainly this purpose is at the heart of what we are trying to explain. In fact, we would argue that this discredited Spanish democracy is our starting point. We think that the mass arrest of politicians (remember that an astounding total of 712 town mayors were charged with “assisting the referendum”), the violent attack on voters, and the imprisonment and exile of political opponents who organised peaceful demonstrations and civil disobedience has revealed a fundementally discredited Spanish state that can only respond to its opponents with force and repression. And yes, we think this needs a complex, difficult and honest debate about what is going on in Spanish democracy. Manuel Serrano argues that the basic problem lies with the “secessionists”, the pro-independence Catalans. And this is reinforced at several points in the argument. He argues, “the secessionist movement came up with a plan: to provoke a disproportionate reaction from Madrid.” The logic is that the violence was the fault of the people who wanted to vote. As for our opinion piece, he implies that irresponsible articles like ours “divide and contribute to the escalation of conflict” and indeed “manipulate” our audiences. So we are somehow implicated too. Political criticism is here replaced with a series of glib accusations. But we will leave our “irresponsibility” and “manipulation” to one side for the moment. More worrying is the characterisation of the “secessionist movement” as the aggressors. This explanation for the Spanish ‘state of exception’ in Catalonia both degrades the complex politics of the present situation and betrays a complete lack of understanding of recent history. The current constitutional crisis has been encouraged by the deliberate revival of a Spanish identity that exploits the paraphernalia of Spanish cultural nationalism. In 2004 the Spanish conservative party, the PP developed a more explicitly nationalist-authoritarian position on Catalonia and Spanish nationhood generally in order to destabilise PSOE in government and build voter loyalty through explicit appeals to Spanish patriotism. The PP’s renewed patriotism was part of a calculated effort to recover political ground after a series of disastrously unpopular policies including Spain’s role in the 2003 invasion of Iraq, the sinking of the Prestige oil tanker and the terrorist attacks in Madrid in 2004. This strategy represented a cynical and calculated bid to shift the role of the state from being a welfare and social provider to being a guarantor of Spanish unity. That is, a repositioning of the role of the state (and the allegiance of voters) from social to national issues. The Spanish government’s appeals to national populism involve a tough clampdown against those who protest against or challenge the Spanish state. From this national-authoritarian perspective, acts that are perceived to be against ‘Spanish solidarity’ are easily reduced to acts of rebellion and sedition that warrant imprisonment and exile. The October 1 referendum was a moment of exposure that demonstrated how the repressive State apparatuses – the police, the courts and the prisons – could be effortlessly mobilised to defend ‘Spanish solidarity’. And the most striking manifestation of success for this renewed Spanish nationalism is clearly illustrated by the nauseating images published by Spanish news agencies of crowds chanting “Go get ‘em” to the Spanish National Police in front of their barracks as they left to prevent the October 1 referendum. As we note in our earlier article, cultural insubordination has been dealt with harshly in Catalonia. Criminal prosecutions are used against rappers and comedians for expressing anti-royalist sentiment; art exhibitions are banned if they mention the political prisoners; and teachers are accused of “hate crimes against the police” for daring to discuss the October 1 referendum in class. If the full mobilisation of those powers is most visible in Catalonia, this clampdown has also been felt sharply across Spain. The writing was on the wall of this lurch into a deeply repressive mode with the introduction of sweeping new powers against all forms of popular protest in 2015. Spain’s ‘gag law’ introduced harsh criminal penalties against the freedom of assembly. We repeat what we said before: the Spanish state today is not Francoist or fascist. Indeed, we use the term ‘postfascism’ to state unequivocally that today’s Spain is clearly not fascist, but at the same time to stress that the remnants of Franco’s fascism in political, economic and cultural modes of power have not been completely eradicated. There are real reasons why, in the weeks running up to the independence referendum on October 1, 2017, spontaneous demonstrations broke out across Catalonia chanting "No Pasaran", "We are not afraid" and singing anti-Francoist resistance hymns. And there is a reason that Pablo Casado (who is now President of the PP but was then Deputy) made a chilling statement in the wake of last year’s referendum. He said: “if Puigdemont declares independence from Spain, he may end up like Companys.” Casado backtracked quickly, saying he was ‘only’ threatening to jail the President. But every Catalan knows exactly what he meant: Companys was the Catalan President who was captured by the Gestapo and then executed by Franco in 1940. And there are real reasons for the demonstrations against the Spanish National Police headquarters that Manuel Serrano laments. The headquarters on Barcelona’s Via Laietana remain in the same building that Franco used to torture his opponents. There is a reason that the ghost of Franco lurks deep in the political imagination of the pro-independance demonstrators, just as it lurks in the political imagination of some of Spain’s most powerful politicians. And this reason needs to be explained. The full explanation takes more than an article of this length, and requires an analysis of how the same political and economic elites were left undisturbed and in place since the advent of the 1978 constitution. And it requires a detailed understanding of the way that the legal and constitutional settlement assisted in reproducing Franco’s judicial mode of power. In many ways, it is an understanding of the latter that Manuel Serrano most overlooks when he points out that the decision to imprison and exile the political prisoners “belongs to the judiciary, and not to the Spanish government.” Of course, this is what is supposed to happen in liberal democracies, but it conveniently ignores how the system in Spain closely replicates the way that political control has been exerted over the national courts since the Franco era. This is one key example of what we described as postfascism. The Audiencia Nacional is the court responsible for inititiating the prosecution of the 9 Catalan political prisoners before their cases are passed to the Supreme Court for trial. This court was created in the image of Franco’s notorious Public Order Tribunal. The judges are political appointees; the court explicitly deals with issues of conflict deemed to be ‘political’. The politicisation of the national courts in the 1978 constitution is also exemplified by the Spanish Constitutional Court. The Constitutional Court is deployed routinely against the various autonomous parliaments when they dare to make ‘autonomous’ decisions. In recent years, this role has been most obvious in the Catalan case. Since 2006 more than 40 laws passed by the Catalonian Parliament have been blocked by the Constitutional Court using the argument that the Parliament has no competency to legislate on such issues. In reality, the Court has been crudely and deliberately narrowing the boundaries of the Catalonian Parliament’s competencies. Most of the blocked laws were concerned with securing social rights, and protecting people against the impact of austerity. Other interventions included the blocking of laws on gender equality and climate change. The Constitutonal Court is not a jurisdictional body; it is not part of the judicial system nor is it regulated by the same law that regulates judges and magistrates. Its members do not have to be accredited judges and are chosen directly by the organs of government. The effect of this clear lack of a separation of powers is obvious. Between 2012-2017, it was presided over by Francisco Pérez de los Cobos, a member of the PP and the brother of Diego Pérez de los Cobos, who was in charge of coordinating the police operations on October 1 and had been a senior official in the PP government. Andrés Ollero, who previously spent 17 years as a MP in the Congress of Deputies representing the PP, is currently the Magistrate of the court. There is a reason that Spain finds it more difficult than any other modern state, perhaps in the world, to make reparations and acknowledge the mass graves. Yes, there is now, 40 years on, some limited acknowledgment that Franco’s body should not lie in state and that there should be no memorialisation of his grave. But just as so many of the street names and statues remain untouched, more significantly, his legacy remains deeply implanted in the constitutional settlement, in the monarchy he restored and now even in the laws he revived for his opponents ( regarding ‘rebellion’ and ‘sedition’). Our argument is not that the constitutional legacy of Franco is the only way to understand the current conflict, but that it gives form to Spain’s legal and political institutions. Indeed, it is the legacy of 1978 that has crucially shaped the governments of both Spain and Catalonia. As we argue in our forthcoming book Building a New Catalonia, the most recent roots of the crisis lie in the economic violence of both Spanish and Catalan elites in the period of austerity. Those elites have tightened their oligarchic grip on both Catalans and Spanish people in ways that have immeasurably deepened inequality, forced people out of their homes, waged war on migrants and exposed Spain’s inability to be truly democratic. And one consequence of the economic violence has been the rise of both Spanish nationalist and Catalan nationalist movements. Yet this is where we argue that those who are interested in redemocratising Spain (and we presume Manuel Serrano is one of those) must recognise the space for economic and social alternatives that the current situation opens up. It is resistance to the postfascist nature of the Spanish state that opens space for transformation in its cultural, economic and political spheres. As Catalonia became a problem for Spain, the mere assertion of its right to decide has come to challenge the foundations of its power structures; the norms and structures of government that uphold Spanish nationalism. Of course we agree that there are dangers in all forms of nationalism, including Catalan nationalism. Yet this is a moment when real social alternatives are also made possible. Because the struggle for self-determination in Catalonia is unavoidably a struggle against postfascism, this means it is also unavoidably a struggle for economic and social alternatives: alternative ways of thinking about where power lies and alternative ways of taking power. This can be our only answer to narrow and self-serving nationalisms of every kind: a popular sovereignty that empowers everyone, collectively, to take control of the matters of state, whatever the national anthem, the flag, or the name that is chosen to represent that state.